Air can become trapped in the high points of the pipes in your plumbing system. Water will move past the air pockets and create small bubbles, which may cause the pipes to make loud ticking or vibrating noises and it can cause the water to spurt from the faucets in quick bursts. Air can also cause a loud thumping sound when a faucet is turned on. Bleeding the plumbing pipes will remove the air and eliminate any noises. Turn on all the faucets in the house to remove air in the lines. Turn on all the faucets in the house. This will increase the velocity of the water flowing through the pipes and may push the trapped air out of the pipes. Allow all faucets to remain open. Flush all toilets several times to push out any air trapped within the toilet supply lines. 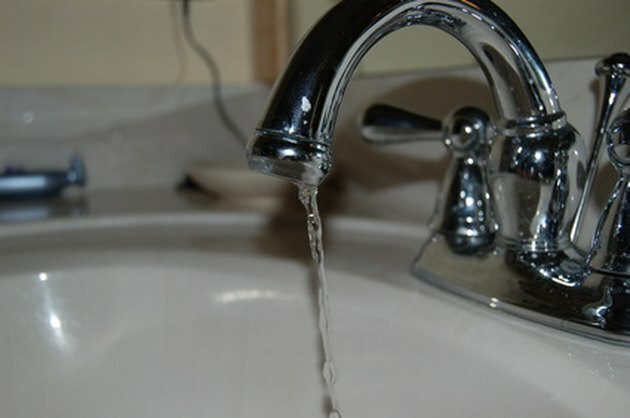 Turn off the faucets after the water pressure becomes steady and the sputtering has stopped completely. Locate and turn off the faucet closest to the main water supply for the house. Then, turn off the faucets in order moving away from the main water supply. Once you reach a toilet, flush it and wait two minutes before turning off the next faucet. Determine if any air remains in the plumbing system. If air remains, you will need to open a pipe to release it. Locate the highest point in your plumbing system. Turn off the main water supply to the house. Remove the water from the lines by turning on a faucet. Leave the faucet on. Cut the pipe near the high point with a hacksaw. Install a tee joint with a ½-inch valve. Secure both ends of the tee joint with pipe-joint compound. Turn off the faucet and turn on the main water supply. Open the valve slowly. The valve will release the air followed by a squirt of water. Plug the valve outlet. This should remove the air from the plumbing system. What Causes the Whine When Water Faucets Are Turned Off & On?